Silicon Valley firms crunched their hardest in 2017 to rebrand ordinary merchandise long produced by other industries as uniquely innovative product lines. Some of them were pretty obnoxious, like Lyft’s totally-not-just-a-bus shuttle service, or WeLive’s attempt to market living in communal housing as a lived experience, or the company selling a “private pop-up space” that is literally a tent. Almost all of them felt like ideas cooked up in an ideological and economic bubble. But just in case you weren’t already very, very tired, here’s some really expensive shoes that are also somehow also a tech startup called Atoms. According to TechCrunch, Atoms co-founders Waqas and Sidra Ali have obtained $560,000 in seed funding. 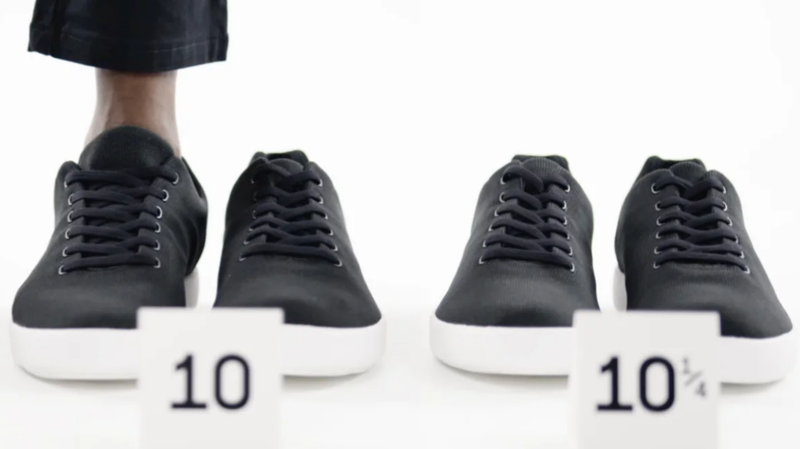 Their venture “modernizing the footwear experience” is a service that ships customers three pairs of shoes in quarter sizes (“say 10.25, and Atoms sends you 10s, 10.25s, and 10.5s, plus socks”), then has them pick one and send back the others. TechCrunch reported the intent is to create “a completely personalized shoe shopping experience,” eventually offering returning customers the ability to further customize their Atoms based on how they wore the prior ones. But Atoms is determined to avoid being labeled a Silicon Valley shoe. Rather than coders, the company wants creative types like painters and graphic designers to be its early adopters. The vision is to create a sneaker a head chef could wear all night in the kitchen without hurting, but that look elegant enough that they could stride into the chic dining room with confidence. One thing that is distinctly Silicon Valley, however, are the prices. At $179 a pop, they are much more expensive than Allbirds, the $95 dollar sneaker-like loafers made of merino wool that became a sort of Silicon Valley fashion statement last year. One could also buy multiple pretty nice pairs of shoes at a store, which doesn’t require multiple rounds of shipping. As for customization, a quick search showed that customized Nikes, Adidas, and Vans can all come in at much lower prices, including this hideous fever dream I generated on the Vans website for just $105 base price and can be ordered in half-sizes. That sounds nice until one realizes that Nike, a 54-year-old company, spends tens of billions of dollars on marketing and associated research and you know, maybe knows how to make a good shoe already. Though perhaps Nike, like me, suddenly feels the need to lay down and take a long nap.